Last week’s EDPA Access 2011 conference in Las Vegas was an overwhelming success. Since 1980, ExhibitCraft, Inc. and I have been very active participants in the EDPA. I am very honored to be on the Board of Directors of this extraordinary organization, that helps to grow and improve the exhibit industry. This year’s conference was jam-packed with educational conference sessions, networking opportunities, keynote speakers (not to mention a golf outing!). One of the most memorable presentations (and there were quite a few, which I might delve into in a future blog post) was the exhibit industry news shared by CEIR President and CEO, Doug Ducate. This was the closing EDPA Access 2011 keynote session entitled, “WHERE ARE WE NOW, AND WHERE ARE WE GOING?” The session kicked off Friday, December 2nd, the final day of Access, with a quick brief on the latest industry research, trends, predictions and indicators. Ducate gave an overview of multiple research results and key economic indicators. Going into detailed data from CEIR Research in his presentation, Ducate provides us with just a taste of the positive outlook we are about to learn of when he says, “The results show that the exhibition industry is healthy, vibrant and growing despite a relatively sluggish economy.” He goes on to share key industry trends. The four key metrics tracked by the Center for Exhibition Industry Research Index include attendance, number of exhibitors, revenues and net square footage. These all showed positive results on a year-on-year basis, except net square footage. Trade shows experienced a 2.6 percent growth, compared with the same quarter in 2010, continuing to buck overall negative economic trends. In the third quarter of this year, trade show growth also beat out the GDP during the same period, which only grew 1.5 percent. Attendance in the third quarter of 2011, which is a healthy indicator of economic recovery in the industry, grew an impressive 3.7 percent. The same period in 2010 experienced only 1% growth. Because Ducate’s presentation was so thought-provoking, uplifting and inspiring, I went on a search for more content that I could share. Two months prior to the event in Las Vegas, Ducate presented for CEIR at the Exhibition Industry Summit. In his 44-page PowerPoint Presentation, which also included material gathered from Exhibit Surveys, BtoB Magazine and CEIR resources, some more positive news regarding trade show event budgets was included, as reported by BtoB Magazine. According to the data reported to by BtoB Magazine, 39% of B2B Magazine Survey Respondents saw an increase of 39% in 2010, while even more in 2011, 52% experienced an overall marketing budget increase. 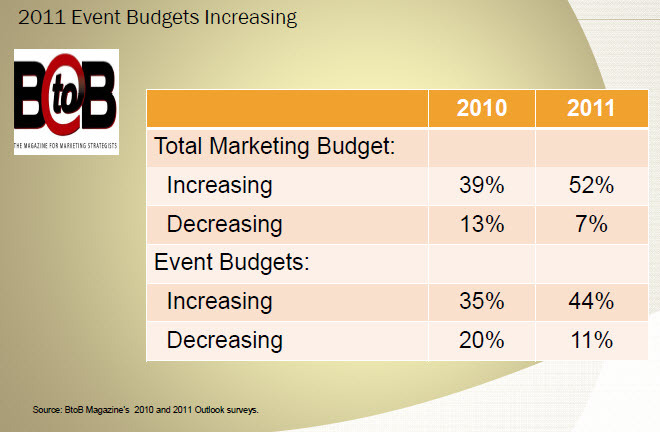 44% said that event budgets increased in 2011, up from 35% of 2010 respondents. The presentation is available for download on the CEIR website. These are just some of my thoughts that I was able to gather for this blog post, which I wanted to write shortly after attending the event. I am positive that our industry, as well as our clients’ industries, will continue to experience growth in the new year and beyond! Thanks so much for your reply, Christopher. Glad you were part of it!